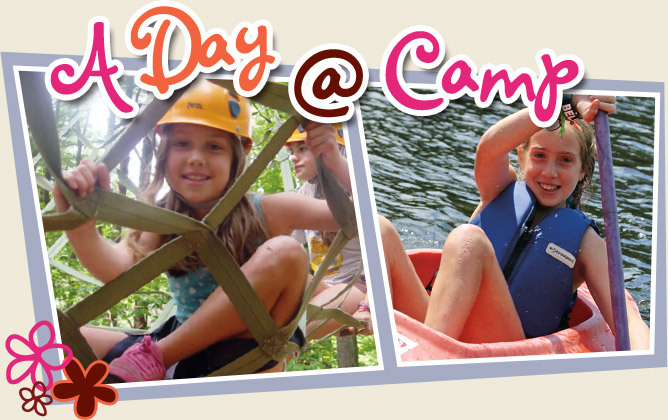 What's a day at an all-girls summer camp like? Well every day is different, but here's an idea of what you're in for! 7:45am Rise and shine! Look everybody - on all the mirrors, the head counselors wrote, "This is the prettiest face you'll see all day!" Everyday they do something different for wake-up. I heard a rumor about Hershey Kisses tomorrow...oh yeah! 8:10am Hurry up, girls, or you'll be late for line-up and flag-raising. Inter-camp competition today, so be sure to wear Timber Tops officials! 8:20am French toast for breakfast! YES! Actually, we're next at the cereal bar, so maybe I'll get some oatmeal. No, singing bunk songs doesn't get you your food any faster. Nice try, Bunk Elm! 8:50am Who's got the clothesline? Where's the dustpan? Oh, no - only 10 more minutes 'til inspection. I better check on the clotheslines! This week we'll get a gold ribbon. I can feel it! 9:30am-12:30pm Let the activities begin! Fifty minutes each period. Ten minutes in between. There is a lot of individual choice, but more as you get older. Three activities in the morning. Everything goes really fast. On a typical day it might be - 1st - tennis lesson, 2nd - swim instruction, 3rd adventure climbing. I'm excited for improv drama tomorrow! 1pm Lunch in the picnic grove today. Do I want a hot dog or a hamburger? No, I'll have the vegetarian chili, please - two plums for dessert. Afterwards, three cheers for rest time to write letters, read books and play quiet games with bunkmates. It's OK Lindsay, take a nap. Our counselor will make sure you get up to go to your next activity on time. 2:30-4:25pm Fourth choice activity - ceramics. Camp is back in action. Keep on moving, girls, fifth period soccer starts soon. 4:25pm General Swim! Time to play in the pool with a buddy! Or are we at the lake today? Let's paddle in boats! But then I want to play on the beach for a while. 5pm Hit the showers, troops! Oops, can I borrow your shampoo? I have to ask Missy to get me some more! 6pm Back at line-up and flag-lowering. Listen up, girls, or we won't know where to go for evening activity. Dinnertime. Bunk Pine's turn at the salad bar first. Apple cobbler for dessert? My favorite! 7pm Hobby Time! Wanna help me finish painting my frame or should we play a quick game of tennis? Oooh, archery is open! Let's do that! Here come our Big Sisters. Let's go show them the earrings we made. Then let's play Ga-Ga. Or do we have rehearsal for the camp show? 8pm Evening Activity: there is a Luau at the lake. The dance counselor is teaching a hula dance. Check out the pineapple snacks! Join hands and sing "day is done..."
9:15pm Hurry up and turn the lights off! We get 15 minutes of flashlights! Lucky seniors get to stay up later, and I think the 10th graders are even hanging out with Owego Boys. Oooooh! Counselors have a curfew, too! Good night, Timber Tops! See you in the morning!